Identification: One short tail on the hindwing. 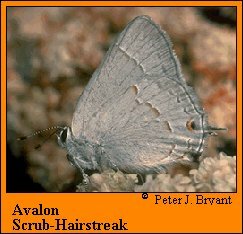 Upperside gray; hindwing with red or yellow spot near tail; may have small white spots at margin. Underside ashy gray, slightly darker on inner half of wing. Submarginal and postmedian lines faint or lacking. Life History: Eggs are laid on terminal buds and on flower buds. Flight: Many broods from February-December. Caterpillar Hosts: Silverleaf lotus (Lotus argophyllus var. ornithopus) and deerbrush (Lotus scoparius). Adult Food: Nectar from flowers including common sumac (Rhus laurina) and giant buckwheat (Eriogonum giganteum). Habitat: Chaparral and grassy areas. Range: Found only on Santa Catalina Island, off the coast of southern California. Conservation: This species is one of the most limited U. S. species and should be conserved. Management Needs: Maintain stands of host plants. Prevent loss or destruction of habitat.